Many thanks to SWLing Post contributor, Moshe Ze’ev Zaharia, who submits the following videos of his reception of Radio Kuwait at 10:30 UTC on April 6, 2018 from his home in Israel. Many thanks for sharing, Moshe! Did anyone else note this echo? I wonder what happened at the Radio Kuwait transmitting station to make this happen? Or, perhaps, it was a fault with the audio feed they received? Please comment! This entry was posted in News, Recordings, Shortwave Radio and tagged Moshe, Moshe Ze'ev Zaharia, Radio Kuwait, shortwave, Zenith Transoceanic on April 10, 2018 by Thomas. Several months ago, we conducted a shack photo contest sponsored by Universal Radio. I’m posting all of your excellent photos as time allows and putting them under the tag, shack photos. The following is the third set of ten photos along with any notes that were included. 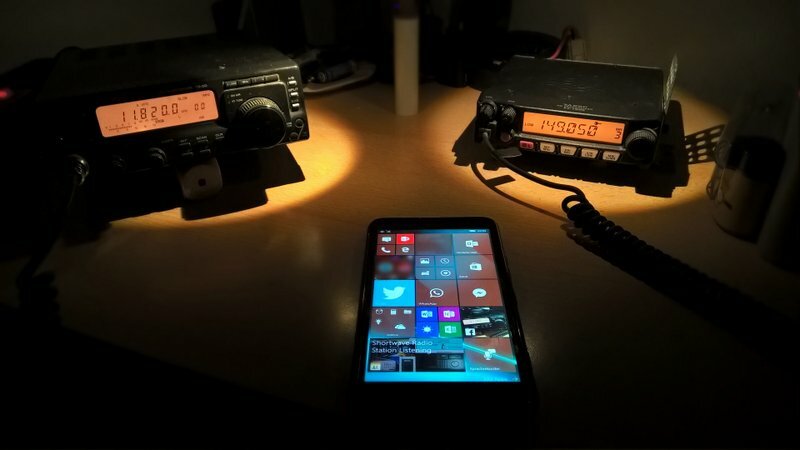 Notes: I have a Kenwood TM-D710G with lots of bells and whistles (center-right), including APRS and packet capability, Echolink, computer control, programming and data output, not to mention the regular functions of a dual-band, cross-band repeat radio. Another rig above and to the left (under the computer monitor) is my main all-mode rig, a Kenwood TS-2000. To the right is an old Swan 350 transceiver and power supply. There is an old manual Dentron tuner above that, and sitting atop of it all is an analog Uniden Bearcat BC898T scanner. 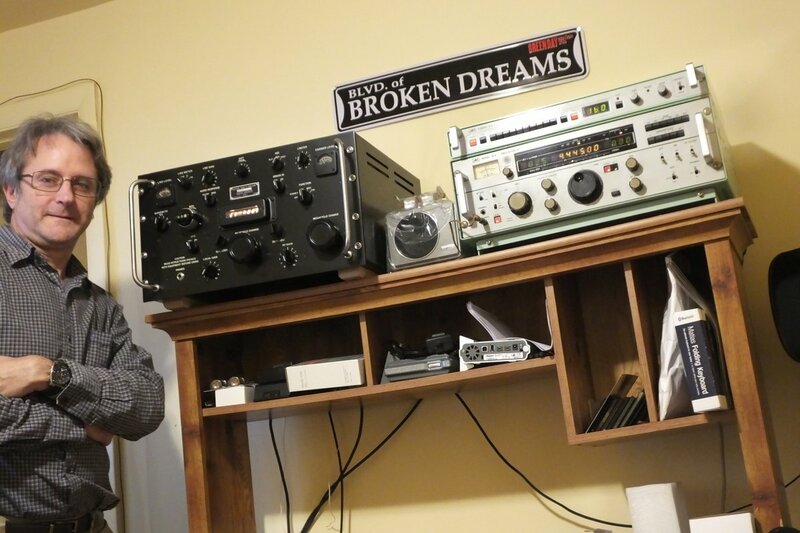 There is an amplifier, a 220Mhz rig, several HTs, and on the bottom right my pride and joy Yaesu FRG-7 shortwave receiver. I currently have 6 speakers for various sound outputs. 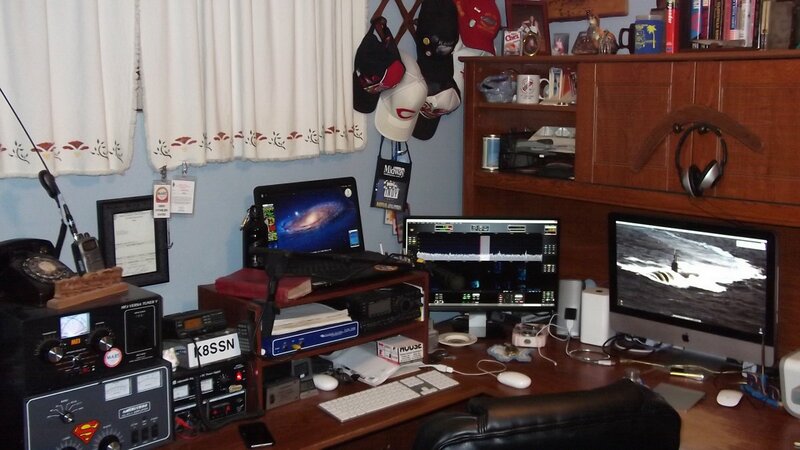 Out of the frame are two more computers, two SDR receivers, another monitor and a sound mixing board. 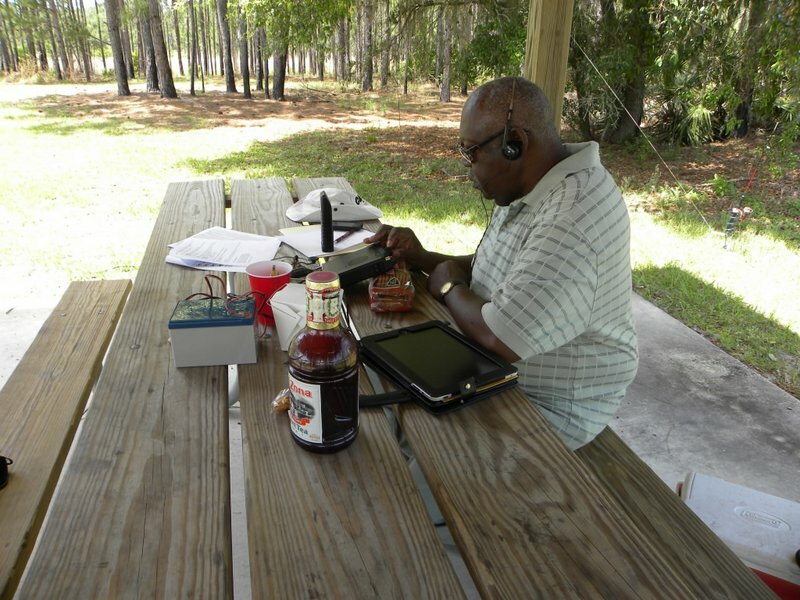 I won’t begin to mention all the portable SW radios and several old DX-160s (my first real SW radio). I love listening/transmitting here, but I also take portable radios around the house and on the front or back porch as the mood hits. 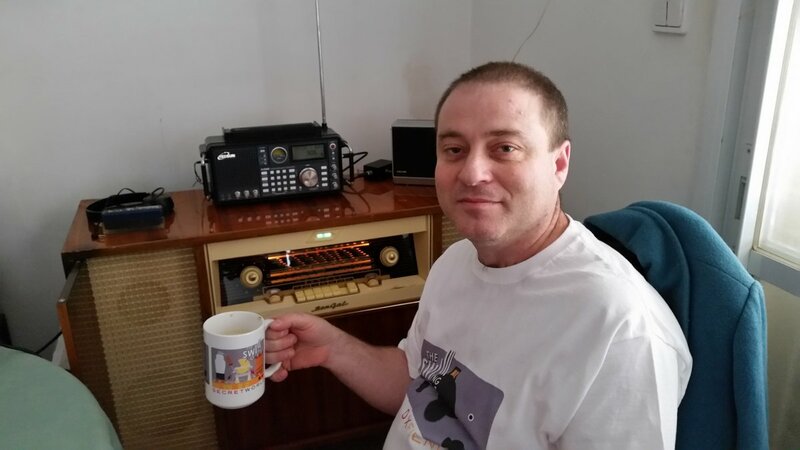 I love my Graundig Yacht boy 80 radios which I won from DW (german radio) and later i bought Sony ICF SW35. I use telescopic antenna and sometimes I use a reel antenna. I have very little technical knowledge about the radios and antennas used. Still, I keep on experimenting and sometimes found far far away stations, which is obviously a thrilling experience. 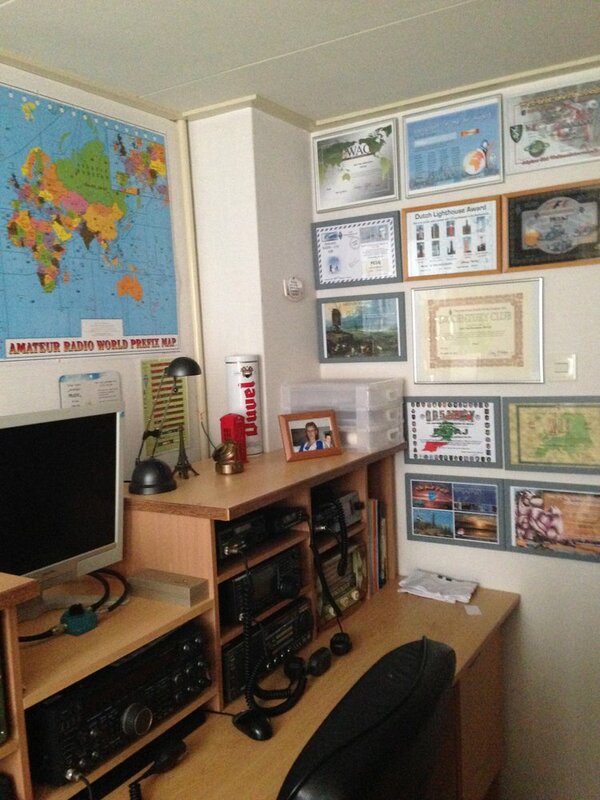 with this hobby of DXing I have learned a lot about different cultures and nations. 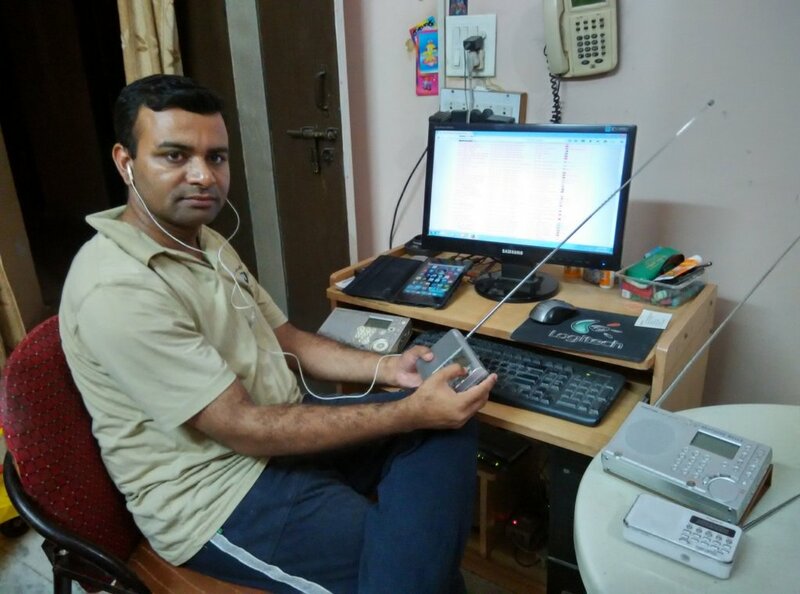 Moreover i am using the internet technology to get far away stations which are not targeting my country/region and the WEB SDR is the best source. 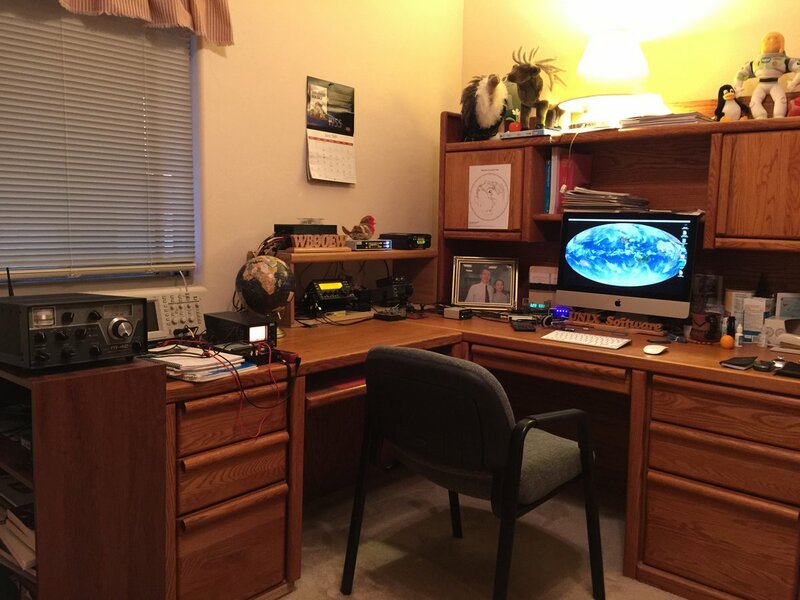 Notes: Ray’s main shack rig is the Yaesu FTDX5000MP. Notes: The Drake Receiver is my best–using a long wire and an antenna tuner. 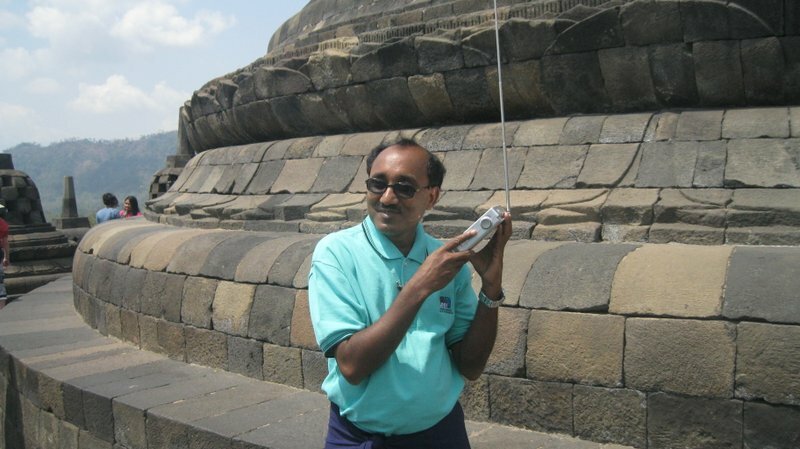 Notes: In the photo above, I am listening to radio at world famous Buddhist temple in Barbadur, Indonesia. Photo taken while I was surfing and listening voice of Indonesia and general overseas service of India on the temple. I have been listening to radio for the past 32 years and continue today. Due to this hobby, I won two free foreign tours till date and hope there will be some more. Random wire, roughly 45 feet draped around my room. My bedside radio is a Grundig Yachtboy YB-400 with another random wire draped around the room. 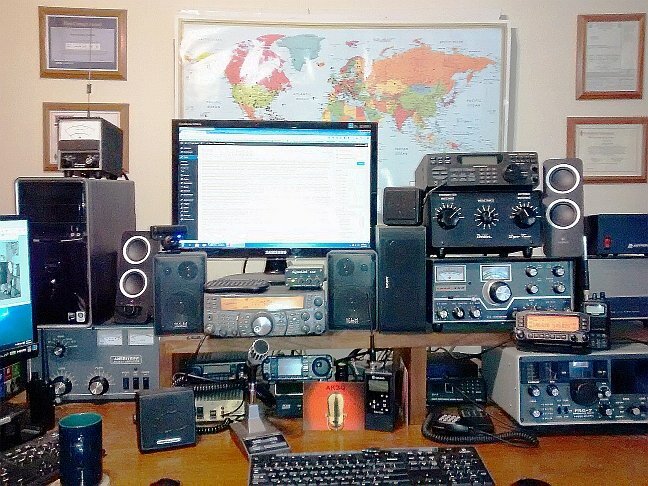 In the photo (above) you’ll find the Icom IC-735 on the Astron RS-35 power supply, MFJ-949E tuner and Bencher paddle, a Radio Shack Pro-106 scanner, Icom IC-3AT 220 HT and Yaesu FT-2900R. Notes: My favorite receiver is none other than Tecsun PL-660 as it pulls a lot of far away radio stations without any external antenna!!! On MW I could log a number of South Korea, Japan, and Australian radio stations.On shortwave, numerous far away radio stations including 1 KW Australian Marine Weather Broadcast station VMW. 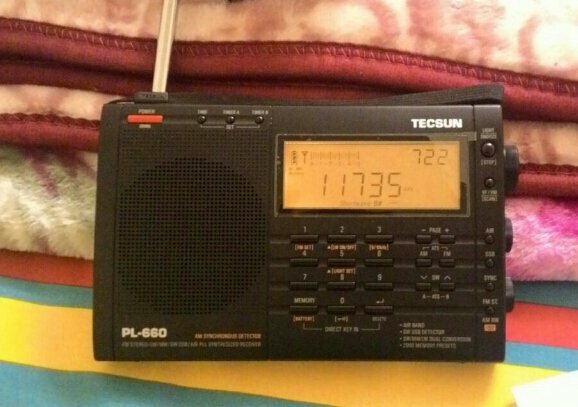 On longwave…Vow…Ireland radio on 252 khz…What else do I need from a budget Tecsun? The tinyTecsun PL-660 is my DX magic box !!!! So,This is my listening post! Notes: This is my little shack that is located in my backyard. Notes: My Listeningt post consists of my fav. 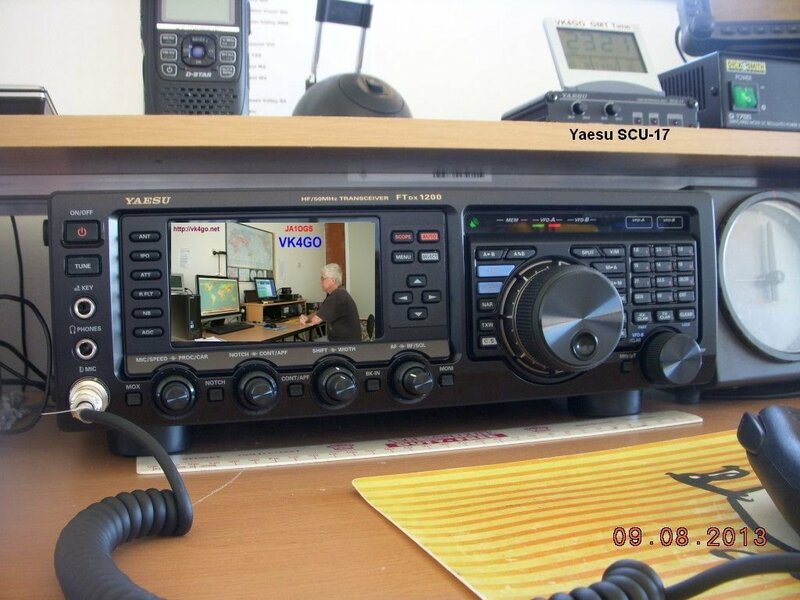 Kenwood TS-50 (30khz – 30Mhz) and a VHF YAESU FT-1900. All night long when my kids are in bed, I spend my time listening to numerous SW Stations. 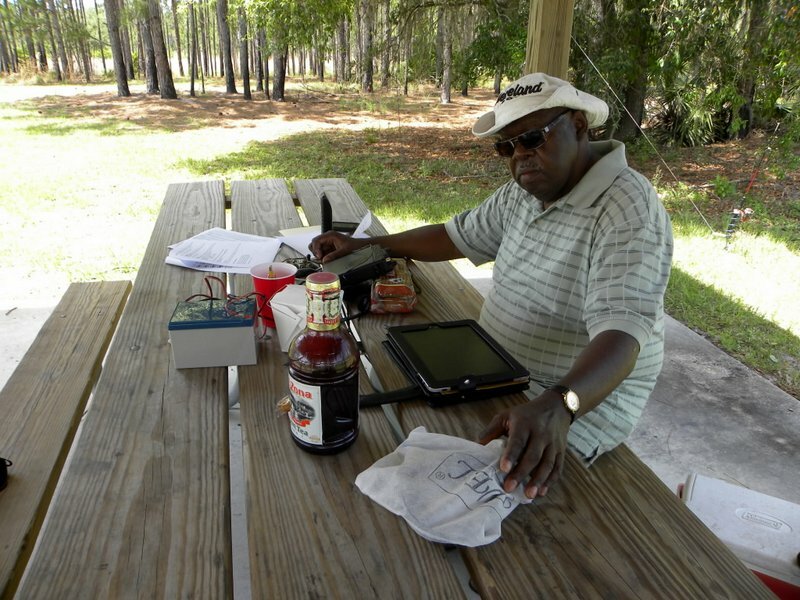 Notes: Here are four photos of a portable outing “QRP to the field” op in April 2013. 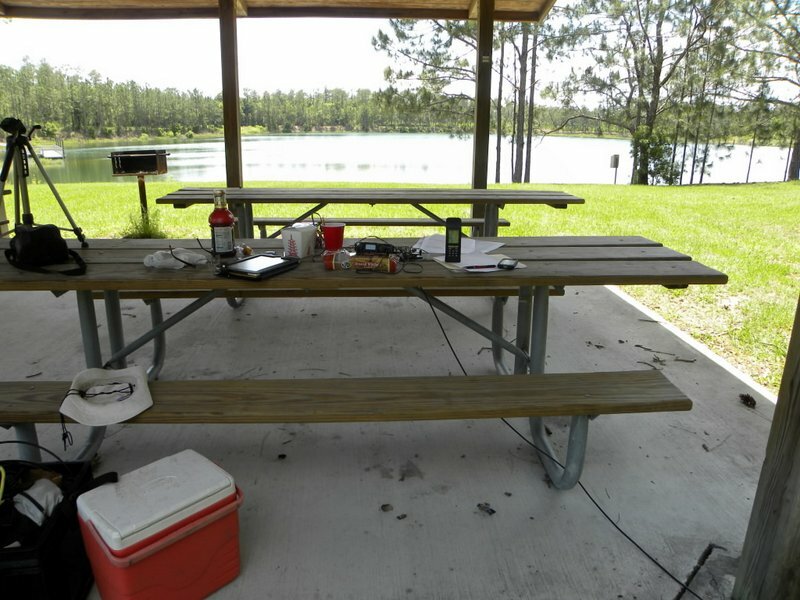 This park is called Bear Pond and is located in the Seminole State Forest, west of Sanford, FL on SR 46, about four miles from my house. I love this place. Great place to have lunch and play radio. 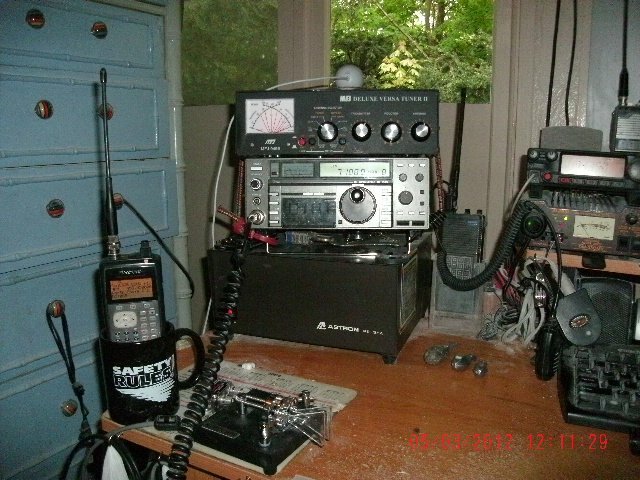 The rig is a Yaesu FT-817ND QRP transceiver, a PAR end fed wire antenna, and SLAB 12v 10AHr battery. Apple IPad does the logging chores. Add some Chinese food, some almond cookies, a little sweet tea, Hmmnnnnnn, life is good! Life is good, indeed, Hank! What a great way to cap off this third set of shack photos! 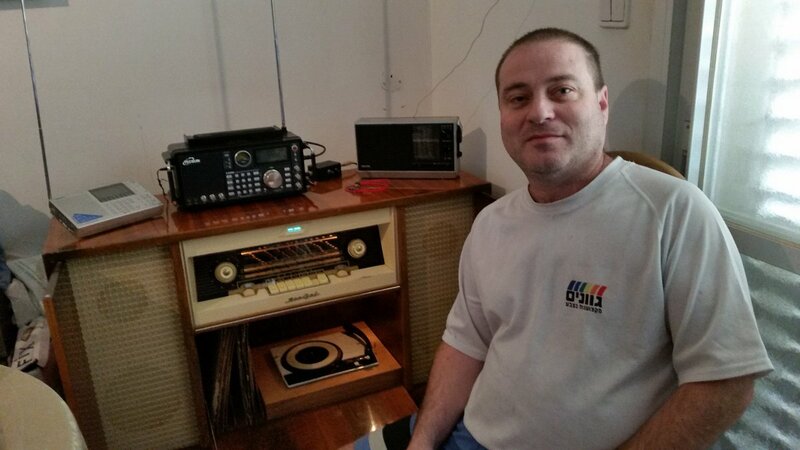 Again, many thanks to all who sent in their listening post photos. I absolutely love the variety! Follow the tag Shack Photos for more! 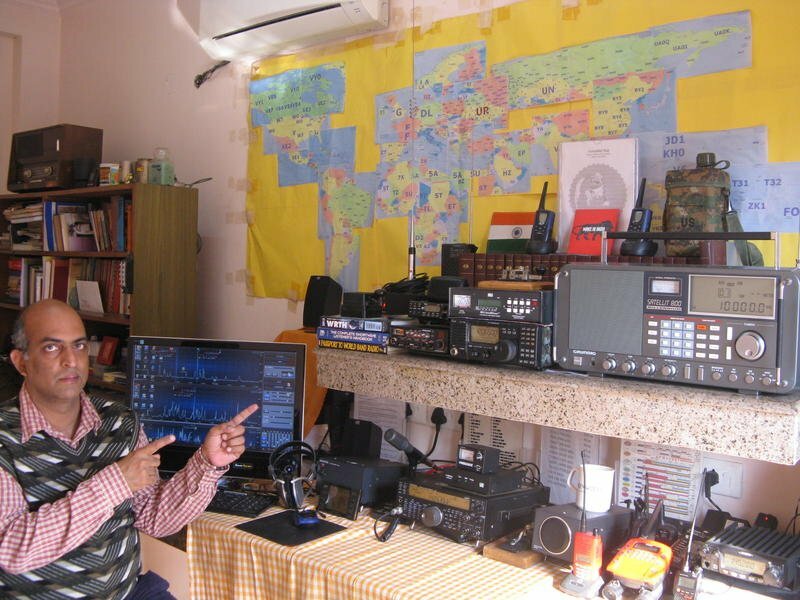 This entry was posted in Ham Radio, Listener Posts, News, Photos, Shortwave Radio, SWLers and tagged Clyde Ramsdell (N1BHH), Darwin McDonald (SWL/W8), Hank Dean (KU8S), Jawahar Shaikh, José William, Listening Posts, Mahesh Jain (57HS4688), Moshe, Peter Ströhlein, Ray Sylvester (NR1R), Robert Gulley (AK3Q), S B Sharma, Shack Photos, Shortwave Listener Posts, SWLs on April 13, 2016 by Thomas. The following is the second set of ten photos along with any notes that were included. ?My radio shack has radio from two generations, that is, my father’s tube radio, viz., Murphy TAO 776 MARK II. My father, Mr. P. R. Chandwani, also a Shortwave Listener, purchased Murphy Radio in Summer of 1971. I used to see him install wire antenna between to bamboo poles or mesh antenna in our room for shorwave signals. I love this old murphy radio. I carried on further the legacy of radio listening till 2005 and then got my Ham ticket. My radio shack also have state-of-the-art technology radios, like, Kenwood TS-590s and Grundig Satellit 800 Millennium. Overall, it is the love for radio, experience of years & years of listening works out. 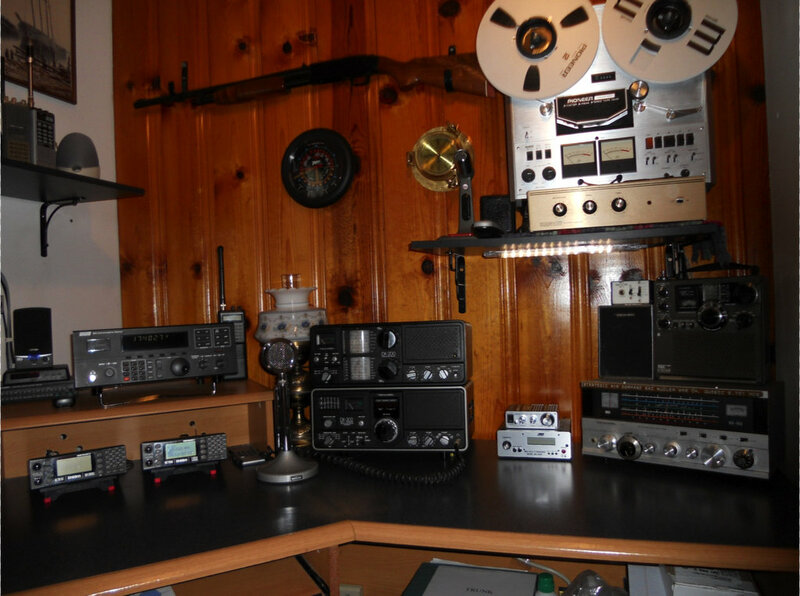 Even after becoming ham, I still indulge in Shortwave Listening, AM Bands and FM Dxing. It is a lot of fun. 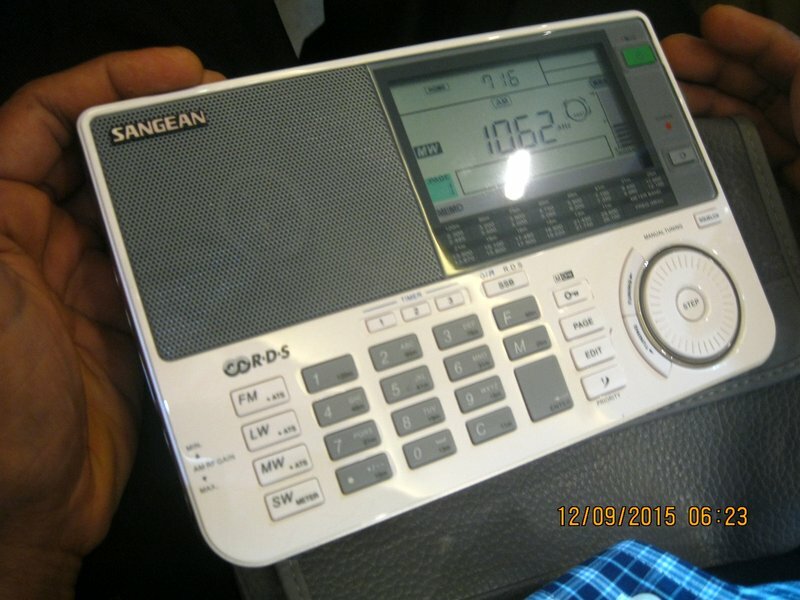 My 14 year old son, viz., Chittaranjan too some time takes interest in radio technology. 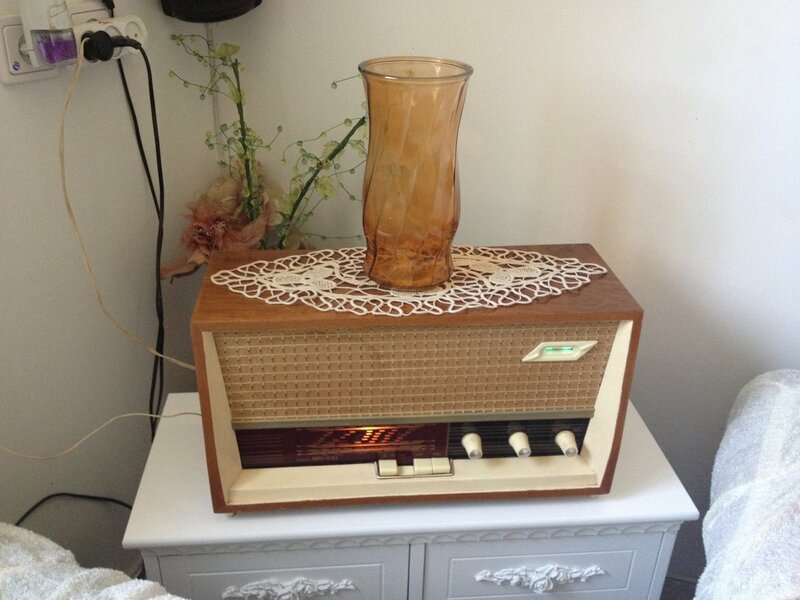 In the first you can see the Ben-Gal Duet Stereo, Tube radio with record player. 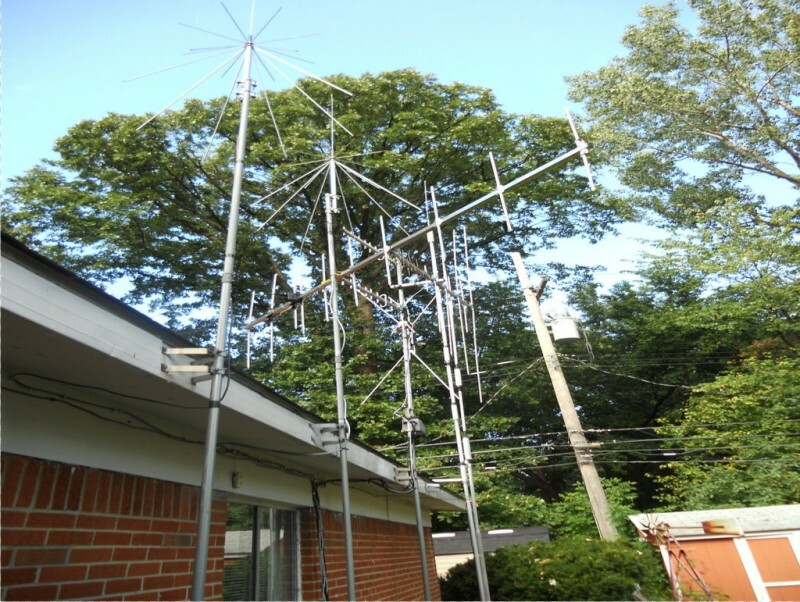 The Ben-Gal covers Shortwave in 3 overlap bands continues from about 2MHz up to about 23MHz, it has an RF stage and it is very sensitive. Above are (from left to right): the Sangean ATS909, Tecsun S2000, and Philips 90AL765. In the second picture is the Ben-Gal Verdi. 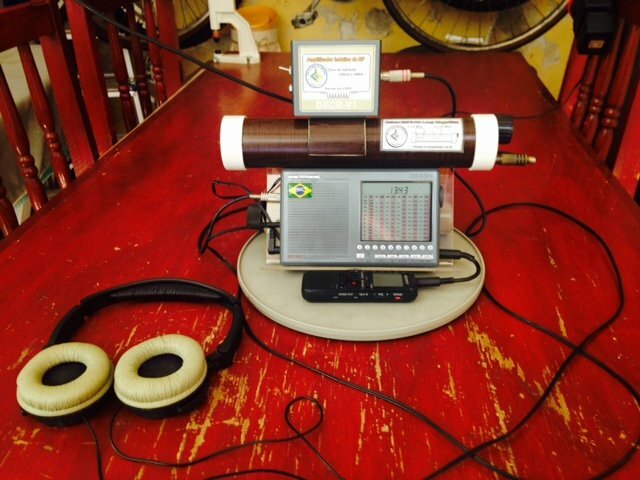 In contrast to the Duet Stereo, it lacks the RF stage, but 15 meters of wire as an antenna compensate for that. I like to lay down on the sofa, in the dark, spin the dial on this radio while gazing the green light of the EM84 tuning tube. Main rig at this time is Elecraft KX3, both on-air and SWL. I also still have my Knight Kit Star Roamer I built in 1970 to which I added a BFO but it is not in the photo. 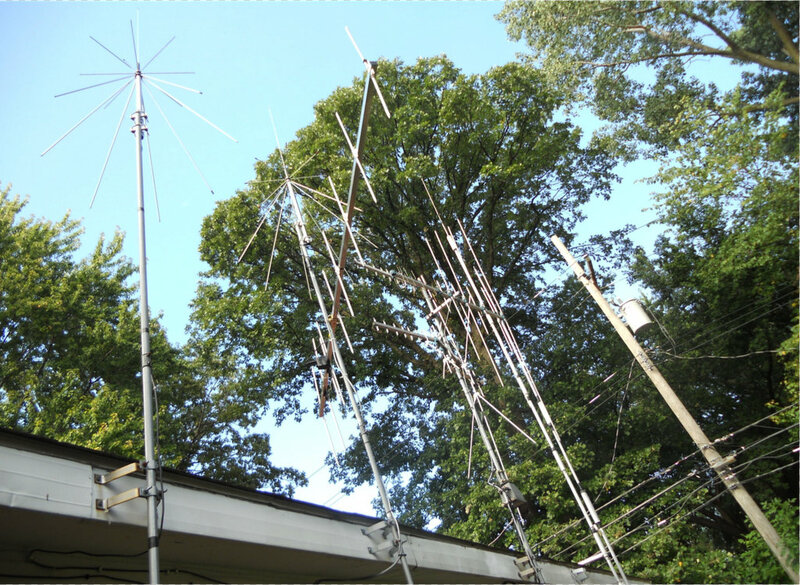 Ham interests include antennas, building and digital modes. SWL interests include WX FAX, utility and military. Here is my Tecsun PL-600. My other toys include UHF-walkie and RTL-SDR, and that’s it for now. 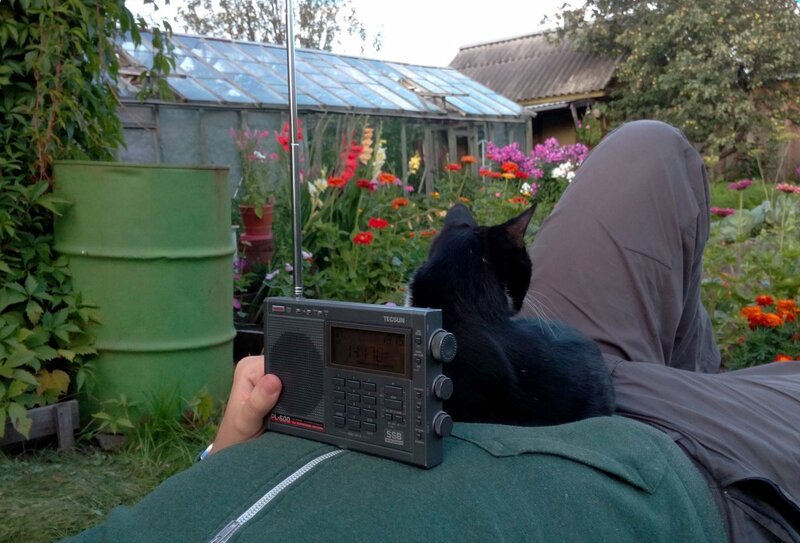 I was laying in my mother-in-law’s garden, in evening twilight, and this very friendly stray cat came and jumped on me to listen 20m hams too. 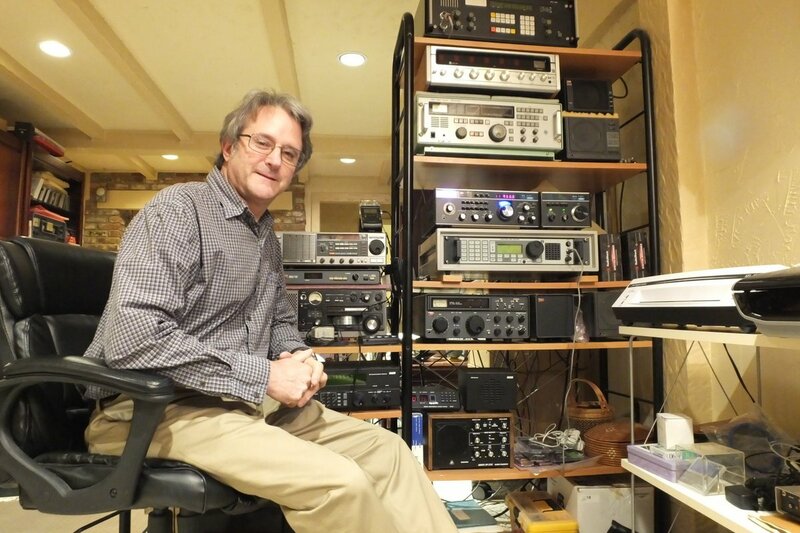 Dan Robinson sits in front of his “main stack” of receivers in his basement shack in Potomac, MD. 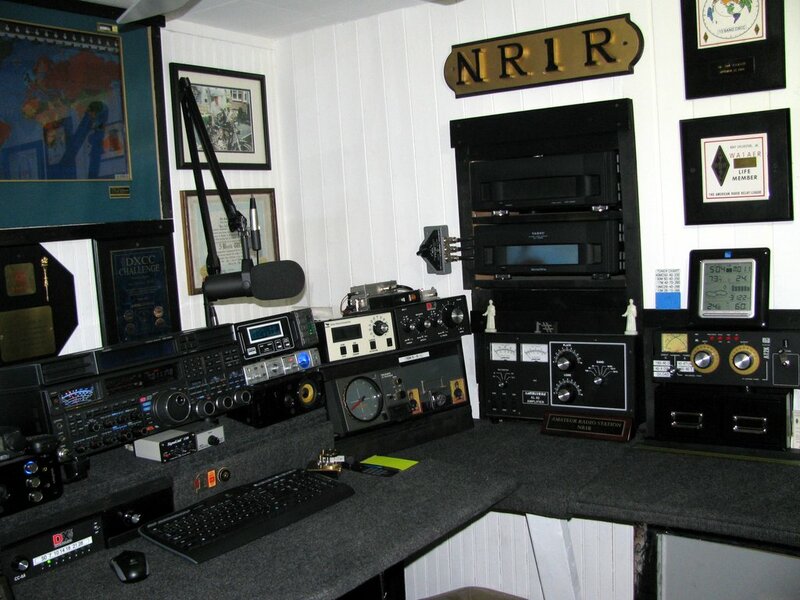 The former VOA correspondent currently runs, from top to bottom, a RFT EKD-515, McKay Dymek DR33-C6, JRC NRD-301A, Drake R7A/RV75, Eddystone 6200, JRC NRD-515. Just behind Dan, you find a Drake R8, SONY ICF-6800W, and a Kenwood R-2000, while not seen behind this veteran DX’er is a NRD-545. Dan notes that the receivers shown constitute only about half of his collection. 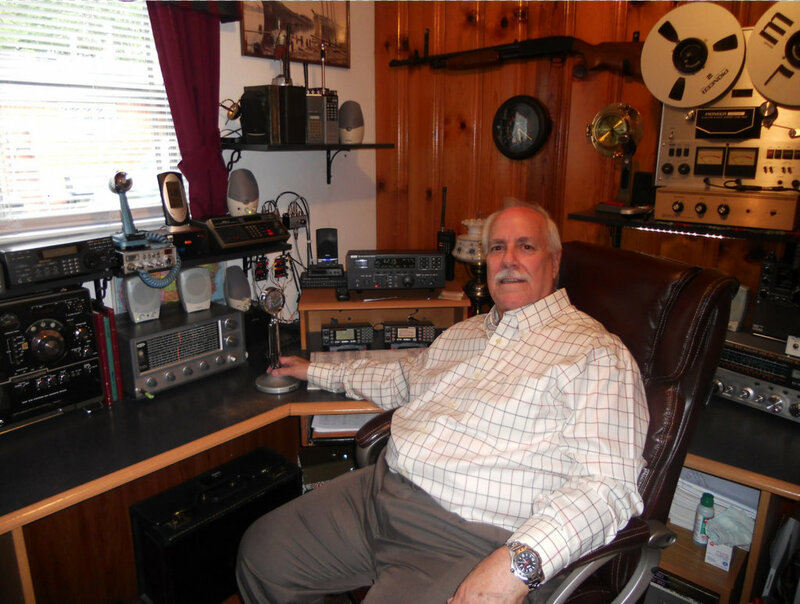 In his “back room” he has everything from a Panasonic RF-9000 and Grundig Sat 650, to an R-390A and JRC NRD-93. Primary radio is a Flex 3000 and a secondary FT900. Location is Hamilton, Ohio. 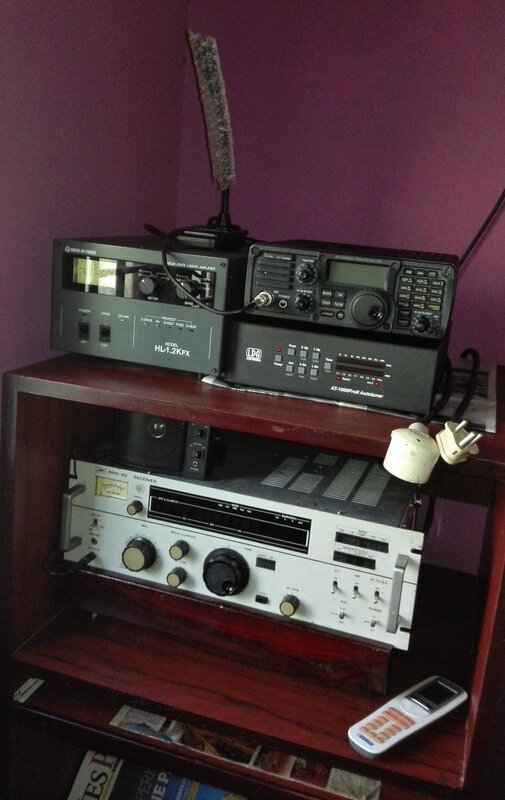 Top is my ham radio equipment and bottom shelf is for my JRC NRD92 – 35 years young. I am a ham since 1963 was born in The Netherlands, moving to Australia in 1980. I am active on the short wave bands. Notes: Hello, my name is Anthony Bueron from the Philippines. 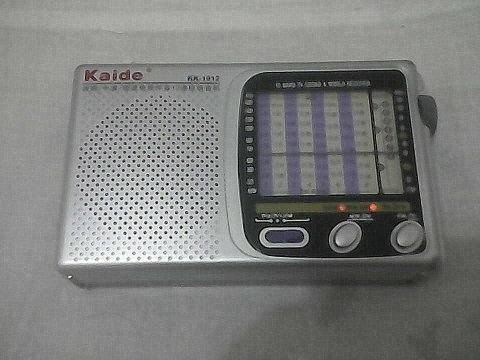 Here is a photo of my shortwave radio. Thanks! From there you may see that I was a short-wave listener for 17 years because of the discrimination of the former communist authorities, before obtaining my transmitter license in 1980. I am a writer, a journalist and a professional certified and sworn translator for 4 languages. I am also my own webmaster at http://yo4px.blogspot.ro where more than 850 articles (translations and own writings) were published in the last 6 years. 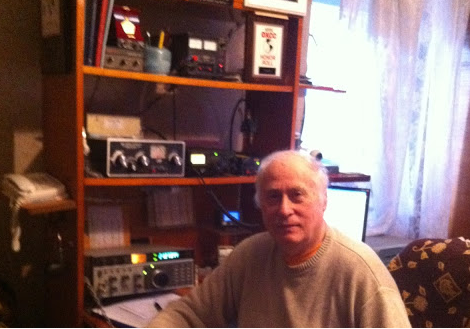 A picture of me in my shack is attached. 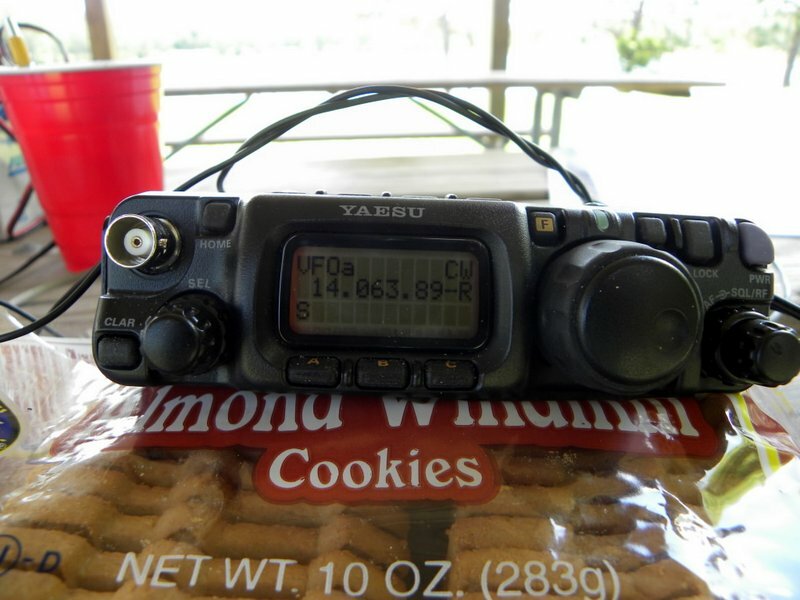 The gear I am using is presented on my QRZ.com page. This entry was posted in Listener Posts, News, Photos, Radios, SWLers and tagged Anthony Bueron, Art van Esch (VK4GO), Dan Robinson, David Self (K8SSN), Elwood Downey (WB0OEW), Francisc Grünberg (YO4PX), Gregory, Listening Posts, Moshe, Moshe Ze'ev Zaharia, Rajesh Chandwani, Satyan (VU3MES), Shack Photos, Shortwave Listener Posts, SWLs, VU2OEC on March 11, 2016 by Thomas. Many thanks to SWLing Post contributor, Moshe Zaharia, who recently made my day by sending the photo above (click to enlarge). I told Moshe that I’m pretty certain, he’s the first SWL in Israel to snag both an SWLing Post coffee mug and tee shirt! 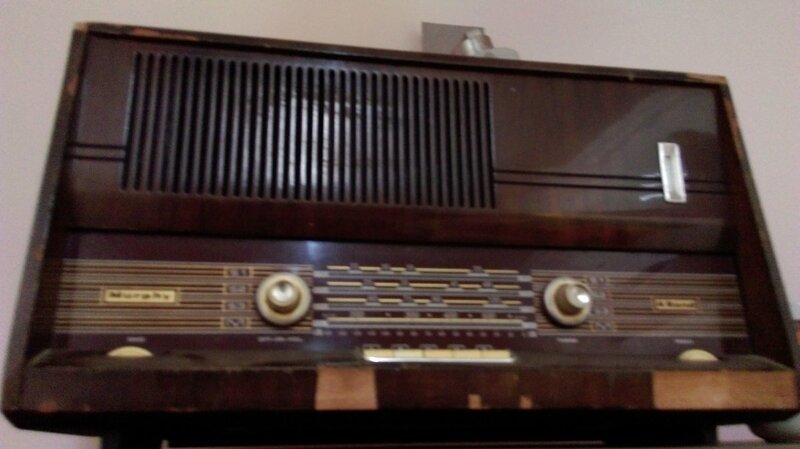 Check out that Ben-Gal “Duet-Stereo” console radio–the same one he recently cleaned and repaired. What a classic! Love that backlit dial.. Thanks again for sharing, Moshe! If you’re looking for some SWLing Post swag, check out our CafePress store! 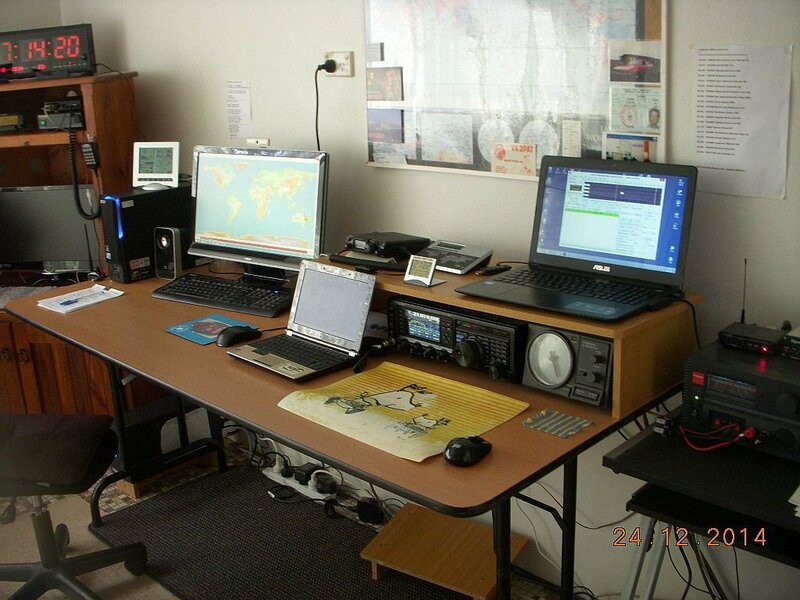 This entry was posted in News, Photos, Shortwave Radio and tagged Moshe, SWLing Post, SWLing Post Swag on February 14, 2016 by Thomas.